SYNOPSIS: When Yukari Morita decided to look for her missing father who disappeared in the South Seas, she had no idea how far her journey would take her. Just traveling to the Solomon Islands is a long way for a high school girl to go on her own, but then Yukari runs into an astronaut from the Solomon Space Association, which has been trying to build a rocket powerful enough launch a man into space. Upon meeting the petite Yukari, however, SSA director Nasuda realizes that she's small enough to go up in a less powerful rocket the SSA has already built! So he offers her a deal: if Yukari agrees to become their astronaut, the SSA will help find her missing father! Will Yukari have the right stuff to blast off in the wildest space quest ever? Find out in ROCKET GIRLS! SYNOPSIS: No matter what the odds, life will find a way to continue, and young Phos and her fellow Houseki are the ultimate proof. Instead of flesh, their bodies are made of living crystal, allowing them to survive in a world too toxic for any human. But their gem bodies also attract a terrible danger: the Lunarians, who hunt the Houseki and use their shattered forms to fabricate jewelry and ornaments. The Houseki with the strongest forms defend the others, but Phos is too weak and brittle to fight. Instead, she is ordered to compile an encyclopedia; but could her research discover hidden secrets that could help the Houseki? Join Phos, the toxic Cinnabar, the powerful Bort, and valiant Diamond in a glittering world unlike anything you have seen before: the LAND OF THE LUSTROUS! SYNOPSIS: The world we knew is gone. The massive cities, once filled with people, lie silent, empty and decaying. There are no more forests filled with animals; no more birds in the sky. But life hasn't disappeared completely; not just yet. Amidst the rubble two small figures, young girls, travel together, scavenging what they need to survive as they explore the remnants of a world that they are too young to remember. It's a strange journey, but one that's filled with wonder as each new day brings another discovery, another echo of the devastated past or moment of unexpected beauty. And as long as Chito and Yuuri have each other, they have a reason to keep pressing forward. 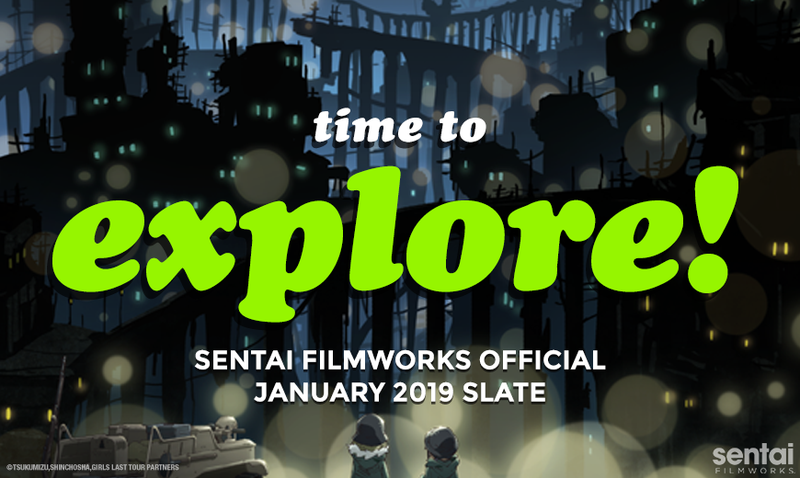 As long as there's still life, there's still hope for a future in GIRLS' LAST TOUR.